Soothe and nourish your baby’s delicate skin with the No.1 pediatrician recommended baby brand! 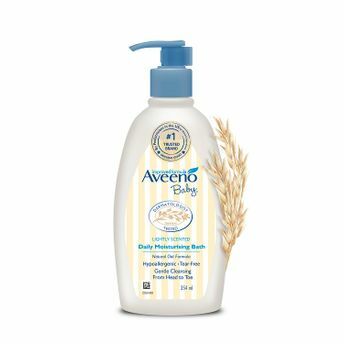 Aveeno Baby Daily Moisturising Bath blends natural oat extract into a rich lathering cleansing wash. It includes 5 vital ingredients present in oats, also naturally found in healthy skin. This tear-free formula can be used on the skin as it gently cleanses and nourishes, leaving behind a soft, fresh fragrance. Aveeno Baby Daily Moisturising Bath is formulated to be gentle enough even for infants and babies’ sensitive skin. It’s tear free, soap free and paraben free. Aveeno uses select natural ingredients because of their advanced benefits. These are called Active Naturals, natural ingredients uniquely formulated to deliver visible results. Scientists at Aveeno follow highest standards of ingredient selection, formulation and manufacturing, with processes that retain the strength and purity of such ingredients. Additional Information: The makers of Aveeno have been harnessing the power of natural ingredients for more than 65 years. The brand offers scientifically-proven Active Naturals ingredients in a full range of products for face, body, hair and more, that can help bring natural beauty and balance to every member of your family. Dermatologically tested brand, you can depend on Aveeno products both for natural solutions that deliver real skin and hair care benefits. Explore the entire range of Bath Time available on Nykaa. Shop more Aveeno products here.You can browse through the complete world of Aveeno Bath Time .